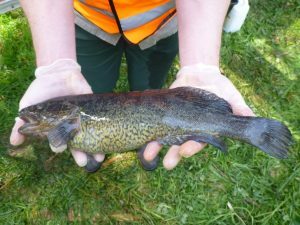 This ground-breaking project aimed to relocate river blackfish to rehabilitated areas in the Tarwin River. Blackfish have a small home range, so they tend not to move large distances. This meant it was unlikely the fish would move to rehabilitated areas, even though work done to fence and revegetate the riverbanks had created suitable new environments for these iconic fish. 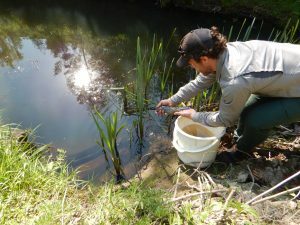 Successfully translocating fish is an important conservation management tool and by reintroducing blackfish into rehabilitated areas, hopefully, the decline in population can be reversed. This five-year, multi-phase project funded through the Recreational Fishing Licence Grants project is the first time anyone has attempted to relocate and monitor blackfish. Being able to re-establish the blackfish population is a good indicator of the health of the river. Why have blackfish numbers declined? Firstly, we needed to identify where healthy populations of blackfish currently existed in the upper reaches of the Tarwin. Fish would then need to be moved to rehabilitated areas in the river and monitored. With funding from the Victorian State Government’s Angler Riparian Partnership Program, we partnered with the Arthur Rylah Institute to complete the project. The Leongatha Angling Club provided invaluable local knowledge about blackfish populations. Tarwin. 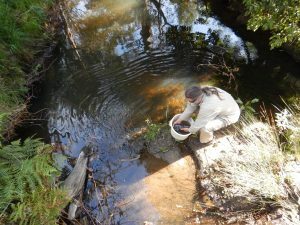 Staff from WGCMA and the Arthur Rylah Institute captured and tagged healthy blackfish and then relocated them to rehabilitated sites further along the river, in areas where they were historically abundant. We collected 27 adult river blackfish which were tagged with acoustic transmitters. The fish were placed into rehabilitated and non-rehabilitated sections downstream. Acoustic receivers were placed at 900m intervals at the sites, to record the movement of the fish. Artificial spawning tubes were also placed in the translocation areas to see if the fish would reproduce during the October – December 2015 breeding season. There were some really encouraging results from the trial. We now know blackfish can be successfully translocated. The second phase of the trial involved monitoring the new locations every year, using electro-fishing. Unfortunately, we were not able to locate any fish in the follow-up monitoring phase. There are a number of reasons why this may have happened. The most likely explanation is that due to a very dry season in Summer – Autumn 2016, the translocated fish may have moved downstream seeking more favourable conditions. There was no evidence of the fish breeding. This could be the result of lack of natural spawning habitat, the stress of translocation or that there weren’t a sufficient number of fish in the original sample. A more detailed report on the results is available here.